Northern Boulevard is one of the most dangerous roads in Queens, according to city data, with an average of more than two people killed while walking or biking each year. The intersection with 48th Street is one of 14 where DOT is installing pedestrian islands and other safety improvements on a 1.3-mile stretch from Honeywell Avenue to Broadway [PDF]. “Northern Boulevard is critical to Queens and the safety of the tens of thousands of people who live near it and travel on it every day, and it’s part of what is really at the heart of Vision Zero,” Trottenberg said. 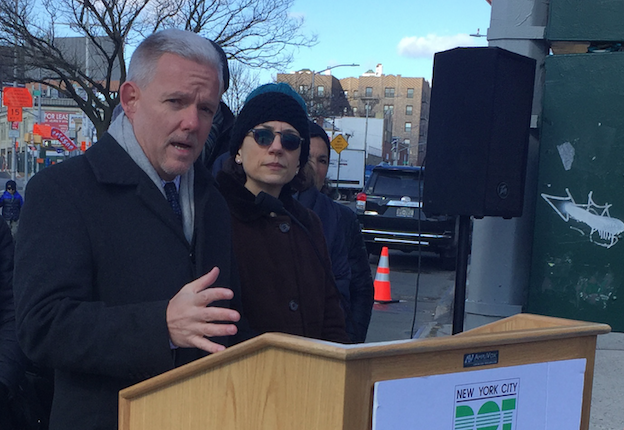 Three years ago, Van Bramer held a press event at the same intersection to call on Mayor de Blasio to make safety on Northern Boulevard a “Vision Zero” priority. “It’s an important corridor, and in the past it has been a dangerous corridor,” Van Bramer said. Since 2014, DOT has installed pedestrian islands at the intersection with 61st Street where an unlicensed truck driver killed 8-year-old Noshat Nahian, and at nine locations between 62nd Street and 102nd Street [PDF]. The agency plans to implement five more between 105th Street and 114th Street [PDF]. Other segments of North Boulevard have yet to receive attention, including the intersection with Junction Boulevard where 17-year-old Ovidio Jaramillo was struck and killed in 2015. Agency reps have said left turn bans, which where implemented at nearby intersections, would be problematic at that location because both streets are designated truck routes. In 2016, all three fatalities on Northern Boulevard occurred in Eastern Queens, where DOT has been absent. “Our intention is to continue over the years to move throughout the whole boulevard,” Trottenberg said about safety improvements further east. These islands are nice. They should have simply shut down the last block of 34th, however. There is no value in this complex intersection.